I know, I know. More soup. 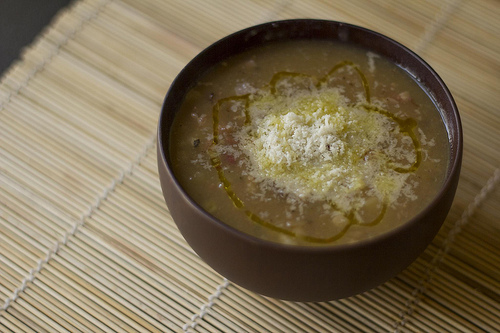 It’s the first day of fall, so a nice, warming soup is perfect for your dinner. One of the reasons I like soups and stews so much is that they really provide an opportunity to build flavor, which gives them a complex, rich taste. In the case of this soup, the complex flavors come from taking the time to brown your meat and caramelize your onions, which adds a deep savory richness to the soup. This soup is pretty easy and hands-off, so while it takes a bit of time to come together, it isn’t terribly labor-intensive. In a large pot, heat the fat on medium-high until it shimmers. Add the Italian sausage and cook, crumbling as you cook, until it is browned, about five minutes. Remove the sausage from the fat with a slotted spoon and set it aside on a platter. Reduce the heat to low. Add the onions. Cook, stirring occasionally, for 30 minutes, until the onions are caramelized. Return the heat to medium-high. Add the sherry, using the side of a wooden spoon to scrape any browned bits from the bottom of the pot. Add the bone broth, mushrooms, salt, pepper, and reserved Italian sausage. Bring to a simmer. Simmer until the mushrooms soften, five to ten minutes. I like mine drizzled with a little bit of truffle oil. While I used homemade duck stock for the soup and ground duck for the meatballs, feel free to replace those ingredients with chicken stock and ground pork if you wish. In the bowl of a food processor fitted with a chopping blade, add one bunch of the green onions, the shiitake mushroom stems (save the caps), 5 cloves of the garlic, half of the cilantro, 1 teaspoon of the gingerroot, 1 teaspoon of the salt, and the mustard powder. Pulse for 10 one-second pulses, or until everything is extremely well chopped. In a medium bowl, combine the ground duck, the sesame oil, the fish sauce, and one tablespoon of the sriracha with the contents of the food processor. Mix with your hands until well-combined. Form into one-inch meatballs and set aside. In a large pot, heat the duck fat on medium-high until it shimmers. Add the remaining two bunches of chopped green onions and one teaspoon of grated gingerroot and cook, stirring occasionally, until the onions are soft, four to five minutes. Add the remaining five cloves of chopped garlic and cook, stirring constantly, until the garlic is fragrant, about 30 seconds. Add the duck stock, the pepper, the remaining sriracha, the carrots, and the sliced shiitake mushroom caps to the pot. Bring it to a boil. 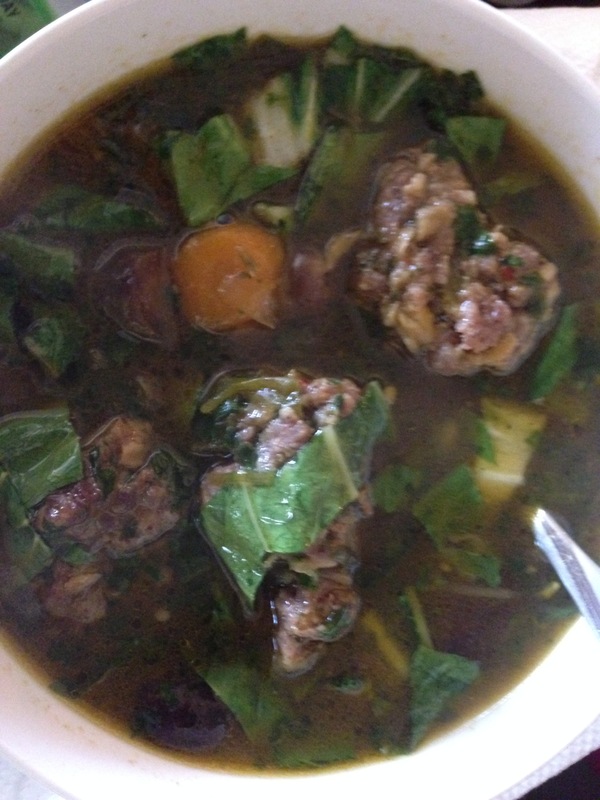 Drop the meatballs into the boiling soup and return the pot to a boil. Simmer, stirring occasionally, for 30 minutes. Add the bok choy and the remaining cilantro to the pot. Turn of the heat. Allow the soup to sit for five minutes before serving.